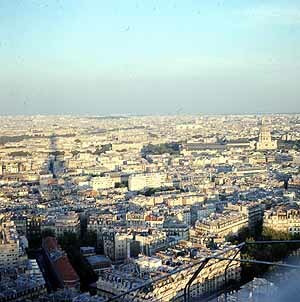 Eiffel Tower view 40 years ago! 40 years ago my wife, daughter and I took our first trip to Paris. I've always been proud of this picture because of the way the Eiffel Tower casts a shadow onto the city below. It must have been taken from the second level because I seem to recall that we didn't have enough money at the time to go all the way to the top. It was a great trip and we'll never forget it. I'd never thought of taking a photo of the shadow of the tower. I'll have to try for a shot like that next time I'm in Paris. Join in and write your own page! It's easy to do. How? Simply click here to return to Best Eiffel Tower Pictures.